Adventurous ECM listeners will undoubtedly be familiar with Joe and Mat Maneri. The father and son team were known for offering their uncompromising microtonal adventures without fear, expectation, or agenda. The music sang with a voice within a voice. Although Joe has sadly passed from this realm, his relentless passion and pursuit of knowledge live on in his recorded work and in the endeavors of his multi-talented sons. Among that progeny stands Abe Maneri, a musically unquenchable soul who has been quietly making independent recordings for years on his own quest for sonic truth. Music has followed Abe, as Abe has followed music, his entire life. An instrumental renaissance man, he plays violin, cello, piano, recorders, guitar, percussion, clarinet, and also sings. Collaborations have placed him alongside likeminded sound-seekers, including Jessica Jones, Sabir Mateen, Assif Tsahar, and John Medeski, not to mention Joe and Mat themselves. 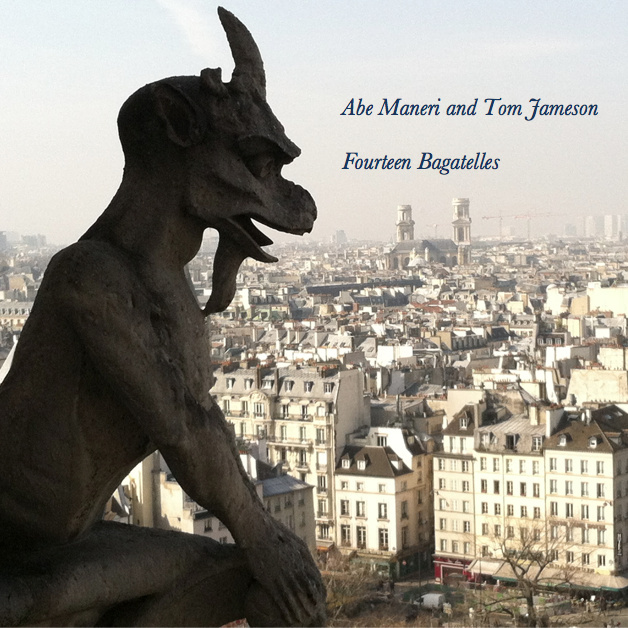 On his latest, Fourteen Bagatelles, Abe is joined by longtime friend and guitarist Tom Jameson. Recorded in Abe’s home studio, the project develops a profound direction in an artist of already broad-ranging interests. Abe’s words make me think about my recent foray into yoga, a practice which requires unseen control in order to maintain its economy of movement. Mind and body resist the holds, storms brewing in every muscle, but eventually you learn to overcome it (or, rather, become it) and enter into a new self-awareness. In light of this, “Melodica and Keyboard” Nos. 1 & 2 sound like fairytales, touched by wind and water and played as if recited. The first is a winding stair into an attic where a single window affords the intermittent blink of a lighthouse. Every sweep leaves a trail along the floor, marking the development of a solitary thought. This heavenly track is the apotheosis of the project. Keyboards creep into a few others, notably twice with guitar in gestures interludinal (“Keyboard and Guitar #2”) and of quieter luminescence (“Keyboard and Guitar #1”). The latter ends a mostly bronzed program with hints of silver. I ask Abe about sequencing. The lion’s share of the album is realized through combinations of various recorders and guitar. Those with soprano, despite their higher pitches, are actually the most earthly, each a cavern of wingbeats. There is also an elasticity to these tunes that gives them great endurance. The alto foregrounds relatively distorted reflections, which nevertheless retain their shape and open our ears to lessons of pattern recognition. In them are distant, pastoral memories. Tenor and bass recorders make one appearance apiece, moving from elliptical arpeggios and Renaissance accents to a grammar that is almost gloomy in its parsing. The greatest comfort of Fourteen Bagatelles is that, by the end of its mesmerizing, lyrical dream, listeners can take comfort in the fact they were awake all along. This album is a flashlight in the dark, a means to an end, which is but another beginning. It is for this reason that, pressing PLAY for another go, I find my thoughts wandering to Abe’s father. I distinctly remember the first time I heard Angles of Repose and the new language it was espousing—a language that, although one I’ll never speak, I can at least attempt to translate. I can’t help but conclude with a question about what Joe passed on to him. And has he changed as a musician since becoming a father himself? It is a purpose we can feel in every note. The cycle continues.